Bone grafts have been used for bone regeneration, structure restoration, and pain relief for decades. Conventionally, autografts were used for bone grafting, wherein the patient’s own bone was used as a graft. Autologous bone grafts are considered a gold standard for bone transplant. However, the usage of autologous bone grafts involves the risk of infection transfer during surgical procedures at both tissue harvesting and transplant sites. This may result in delayed wound healing and prolonged hospital stays. Hence, allografts were introduced in the market to overcome the disadvantages associated with autologous grafts. Allografts possess both osteoinductive and osteoconductive properties, and hence serve as a substitute for autografts. Ready availability of allografts in various shapes and sizes that can be processed in various forms such as chips and others as per the requirement is likely to fuel the allografts segment of the bone grafts and substitutes market during the forecast period. The global bone grafts and substitutes market was valued at US$ 2.7 Bn in 2017. It is anticipated to expand at a CAGR of 4.3% from 2018 to 2026. The allograft segment dominates the global market. Rise in the prevalence of chronic bone diseases, technological advancements, increase in patient awareness and health care expenditure, and rise in the need for the treatment of complex bone diseases are major factors driving the market. The global bone grafts and substitutes market has been segmented based on product, material, end-user, and region. In terms of product, the global market has been classified into allografts, synthetic bone grafts, and xenografts. The allograft segment has been further sub-segmented into demineralized bone matrix (DBM) and others. According to the Centers for Disease Control and Prevention (CDC), the total number of inpatient surgeries carried out in the U.S. was 51.4 million in 2014. Of these, 719,000 were total knee replacements and 332,000 were total hip replacements. Based on material, the global bone grafts and substitutes market has been classified into ceramic-based, polymer-based, growth factor-based, cell-based, and others. The ceramic-based segment has been further categorized into calcium phosphate, calcium sulfate, and others. The polymer-based segment has been further segmented into polylactides, polyglycolides, polyurethanes, and others. Cell-based bone grafts and substitutes are gaining popularity, and the cell-based segment is projected to expand at a significant CAGR during the forecast period. In terms of end-user, the global bone grafts and substitutes market has been divided into hospitals, orthopedic clinics, and others. The expansion of the hospitals segment can be attributed to an increase in the prevalence of various chronic bone diseases. In terms of region, North America dominated the global bone grafts and substitutes market in 2017, owing to a highly developed health care sector, increase in awareness among health care providers about bone grafts and substitutes, and continuous evolution of advanced products. North America is also an attractive region of the market, in terms of revenue. Rise in government initiatives and laws regarding usage of bone graft & substitutes and increase in population drive the bone grafts and substitutes market in the region. Technological advancements and increase in the adoption of advanced bone grafts and substitute products are expected to propel the bone grafts and substitutes market in Asia Pacific, Latin America, and Middle East & Africa during the forecast period. Key players operating in the global bone grafts and substitutes market include AlloSource, DePuy Synthes, Integra LifeSciences, NuVasive, Inc., Stryker, Wright Medical Group N.V., Xtant Medical, Zimmer Biomet, Baxter Healthcare Corporation, and Medtronic. Bones have a natural tendency to heal. However, if the defect surpasses a critical size, then bone grafting is the preferred option. Bone grafting is a surgical procedure that replaces the missing or damaged bone with a natural or synthetic bone. The bone grafts and substitutes market is expanding significantly, due to advancements in the treatment of complex bone diseases. The synthetic bone graft segment is anticipated to expand during the forecast period, as synthetic bone grafts provide a promising solution for rapid recovery from diseases. Increase in the incidence of chronic bone diseases has fueled the demand for products that offer rapid and efficient healing. Thus, a majority of hospitals have shifted their preferences toward advanced products. The products help decrease the average length of stay in hospitals through early recovery from diseases. This, in turn, helps reduce surgical costs, due to decreased length of hospital stays. Therefore, a rise in the demand for advanced products that increase therapeutic outcome drives the bone grafts and substitutes market. The global bone grafts and substitutes market has been extensively analyzed based on product, material, end-user, and region. In terms of product, the global bone grafts and substitutes market has been segmented into allografts, synthetic bone grafts, and xenografts. The allografts segment has been further sub-segmented into demineralized bone matrix (DBM) and others. Based on material, the global bone grafts and substitutes market has been classified into ceramic-based, polymer-based, growth Factor-based, cell-based, and others. The ceramic-based segment has been further classified into calcium phosphate, calcium sulfate, and others. The polymer-based segment has been further categorized into polylactides, polyglycolides, polyurethanes, and others. In terms of end-user, the global bone grafts and substitutes market has been divided into hospital, orthopedic clinics, and others. Each of the segments has been analyzed in detail for market trends, recent developments, outlook, and opportunities. The report provides current and future market size for each segment and sub-segment for the period from 2018 to 2026, in terms of revenue in US$ Mn, considering 2017 is the base year and 2016 is the historical year. The compound annual growth rate (%CAGR) for each market segment has been provided for the forecast period from 2018 to 2026 along with the estimations of market size. In terms of region, the global bone grafts and substitutes market has been segmented into North America, Europe, Asia Pacific, Latin America, and Middle East & Africa. The regions have been further sub-segmented into major countries and sub-regions. The current and future market sizes, in terms of revenue (US$ Mn), of these regional markets and their major countries have been provided in the report for the period from 2016 to 2026, with their growth rate (%) for the period from 2018 to 2026. The study also offers a list of recommendations and highlights of the market for new companies willing to enter the market and for existing companies aiming at increasing market shares. The information is likely to help companies in the decision-making process. 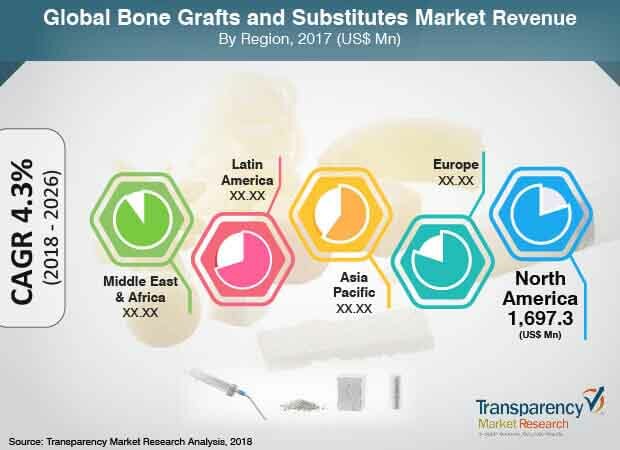 The market overview section of the report demonstrates the market dynamics and market trends such as drivers, restraints, opportunities, and key trends that influence the current and future status of the bone grafts and substitutes industry. The report also covers market attractiveness analysis and key market share analysis in the market overview section in order to provide a thorough analysis of the overall competitive scenario in the global bone grafts and substitutes market. The report concludes with the company profiles section that includes key information about the major players in the market. Key players profiled in this report include AlloSource, DePuy Synthes, Integra LifeSciences, NuVasive, Inc., Stryker, Wright Medical Group N.V., Xtant Medical, Zimmer Biomet, Baxter Healthcare Corporation, and Medtronic. Each of these players has been profiled in the report considering parameters such as company overview, financial overview, business strategies, product portfolio, and recent developments.